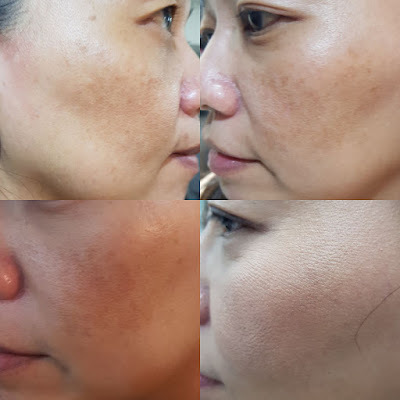 Looking for places to treat your pigmentation? Well you are in luck! Recently I came to find out about One Face Medical Aesthetics. Who are they and what they do? 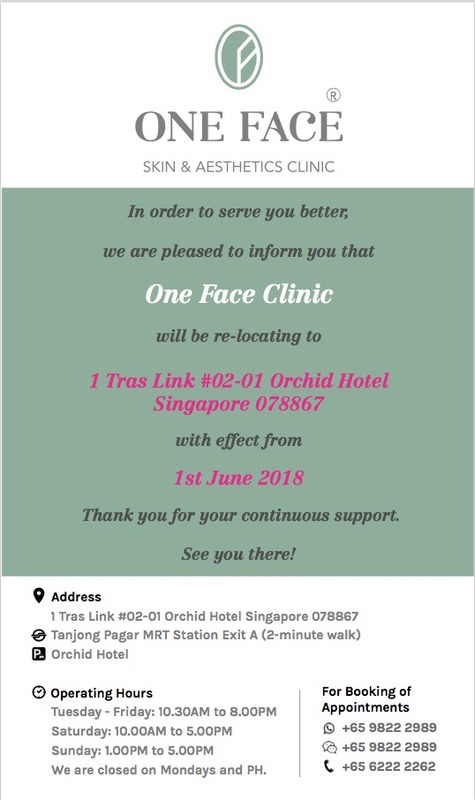 Located in the heart of Singapore, One Face Skin & Aesthetics Clinic is a one-stop medical aesthetics centre offering expert solutions for your skin issues of cosmetic concerns. 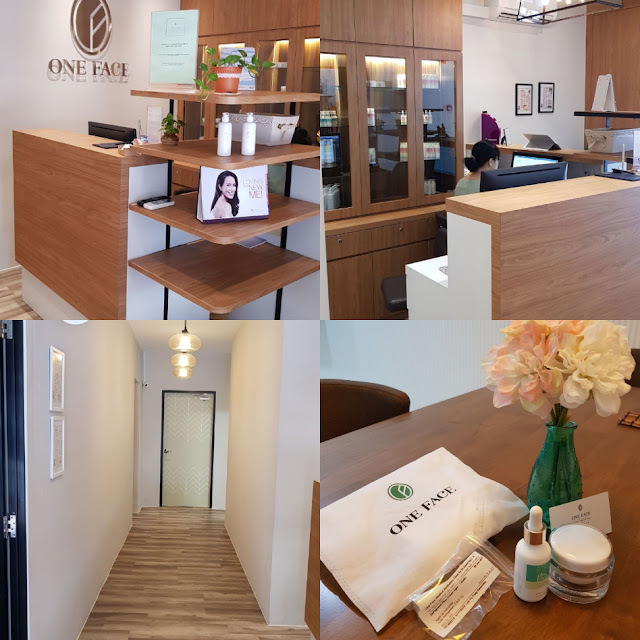 At One Face Medical Aesthetics Clinic, we can be assured of receiving quality medical aesthetics treatments for common skin problems of cosmetic concerns (e.g. pigmentation, acne/pimples, ageing skin, dry and sensitive skin) with competency and efficiency. They provide effective and reliable medical aesthetics treatments and solutions which aimed to be result-oriented, natural looking, comfortable, and safe. Their medical aesthetics treatments and cosmeceutical skincare products not only restore our skin's former glory but also help it shine with exquisite allure and continually nurture a younger looking us. Dr David Ng is the person behind the clinic and also the expert. Dr David have been a doctor for more than 13 years after acquiring his Bachelors of Medicine and Surgery, at the National University of Singapore coupled with a Graduate Diploma in Family Medicine, at the College of Family Physicians (Singapore) and Diploma in Practical Dermatology, at Cardiff University (Wales). In addition, he have also appeared as a guest speaker to share his medical experience in local media such as Mediacorp’s TV Show “Good Morning Singapore” (早安您好), Radio shows Capital FM 95.8 (城市频道), FM 93.8 Live, and HealthWeekly magazines(健康报). He began to focus his profession in the field of medical skincare and aesthetics practice after serving his bond with Ministry of Health with a career kick-start in one of the bigger clinic and group practice in Singapore in the year 2010. His career at this medical aesthetics clinic had gained him years of intensive and quality experience and expertise, during which he became the most senior practising doctor and the official medical aesthetics lasers and equipment trainer for new doctors joining this particular group practice. In October 2016, as the medical director and founder, he started his own medical skincare and aesthetics clinic called “One Face Skin & Aesthetics Clinic” formally known as One Face Medical Aesthetics Clinic. At the same time, he have also formulated his exclusive cosmeceutical skincare line of products, called “Face the Facts”. Their clinic services and skincare products are positioned to provide effective and quality medical aesthetics treatments and cosmeceutical skincare solutions, for the above mentioned common skin problems of cosmetic concerns, which are result-oriented, natural looking, comfortable, and safe. So now you know more about One Face Skin & Aesthetics Clinic, I shall tell you what I'm actually doing there. 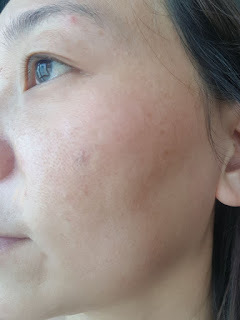 Actually the treatment which I'm invited to do is to treat pigmentation. However I don't have any pigmentation "yet", so I invited my auntie to receive the treatment instead. 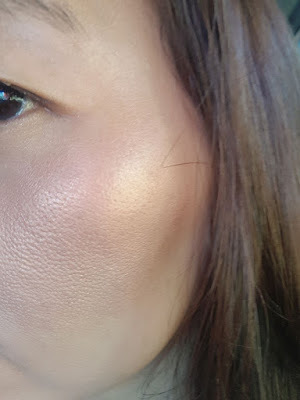 What's Pigmentation and what's the cause of it? Well regardless of your age, if you don't apply sunscreen or even if you have freckles since young, pigmentation will become an issue! Pigmentation is caused by sun exposure and specifically the UVA rays which penetrate deep into your skin and cause ageing. It is a skin condition where patches of the skin turn into a darker shade of colour due to excessive presence of melanin, found on skin surface. Melanin is produced by melanocytes and functions as miniature umbrellas to skin cells to protect the skin from sun and UV damages. The best way to prevent pigmentation if you haven't have it now is to use the right amount of sunblock. Reapply it after a few hours throughout the day – these are what dermatologists consider the best way to prevent freckles, dark spots and of course, skin cancer but the truth is majority of us can’t keep up with this regimen or some are even lazy to do so. You definitely wouldn’t want to look haggard when you are still in the prime of your life. So remember to layer on your sunblock even when you are home!! It's not just about the sunblock. It's also factor alot on choosing the right one! Many have the misconception that the higher the SPF level, the better protection we will get. However, that’s not the case. In fact, using products that are too strong may cause stress to our skin. Generally speaking, SPF 20 provides adequate protection for most of us who stay indoors. You will only require sunblock with SPF 30 and above if you are out under the sun most of the time. Removal of freckles, dark spots and other pigmentation problems can prove to be a hassle. So practicing early intervention is the best way to keep yourself looking youthful and radiant. For those of you already have serious issue from pigmentation, fear not as One Face Skin & Aesthetics Clinic is here to help! My aunt "Samantha" met up with Dr David and team to have a consultation to see if she's a suitable candidates for laser treatment. The clinic look really professional and felt really comfortable after stepping in. 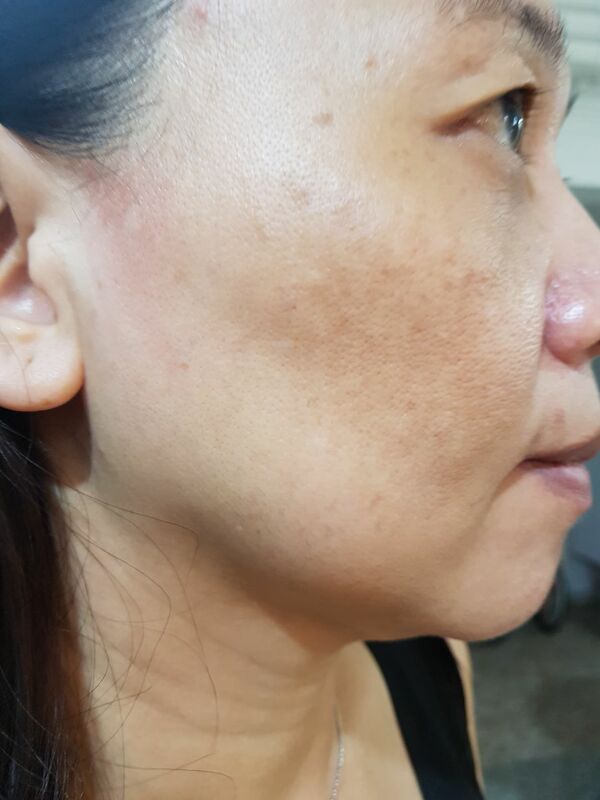 Samantha was given a medicated cream name DPplus for pigmentation to apply at alternate week before going back after 3 weeks to see if she still need to proceed with the laser. Yes there's cream to apply pre-treatment. In some cases, if you are lucky you do not need to continue with laser treatment after applying the cream as it lightens your pigment. The face of my aunt pre-treatment. The bottom right pic that's with makeup on. You can see the obvious pigment. Do stay tune as I will be doing a post review after she goes back for a review! In the mean time, please feel free to contact One Face Skin & Aesthetics Clinic if you have any enquiry or are keen to have a consultation. Luckily my skin hasn't ever had really major issues (knock on wood)... I truly believe there is something to be said about the diet and skin correlation. Lucky you! Yes knock on wood please. Also I agreed with the diet part. Lucky you that you dont have any pigmentation and lucky for your auntie who got to experience the treatment. The results speak for themselves! Thanks dear! Yes am glad that she's able to experience the treatment. Wonderful review! Your Aunts skin looks great. Glad she was able to find somewhere so nice to be treated. One Face Medical Aesthetics sounds like an interesting place! I learned a lot from your article. Thanks! Nice before and after photos! It really did make a visible difference. Thank goodness I don't have pigment issues. But I can say sunscreen is very important for anyone spending any amount of time in the sun. The results is amazing!! Is been a while since I go for face treatment!! Sunscreen is very important! I need to keep reminding myself to always apply it when I go outside. 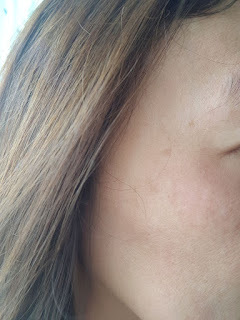 I also have pigmentation, which got worse with my pregnancies, regardless of how much sun protection I used. But I also cover it with makeup.